While Movement has made their mark in the ski industry with some of the lightest skis known to man, their focus with the Race Pro Carbon Pole was a bit different. Making one of the most cost-effective race poles on the market was seemingly the focus here. Weighing only slightly more than most other carbon race poles, the Race Pro costs much less. Lower cost doesn’t necessarily have to mean lower quality though. The long 3D EVA Foam Grip allows you to choke up while side-hilling or on technical descents and the quickly adjustable strap is soft, flexible, and comfortable. The dangerously sharp carbide Nordic tip is good for reducing slip-outs on hard snow. Surrounding the carbide tip is a generously sized 91mm basket, which provides more than enough flotation to boost you to the front of the line. The Race Pro Carbon pole is a high-quality race pole at entry-level costs. 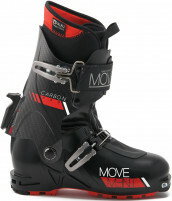 Long 3D EVA Foam Grip is perfect for technical skin tracks, descents, and booters. Large 91mm basket gives ample flotation for such a light pole. Carbide Nordic Tip is sharp and reduces slip-outs.